Reward vs. risk? You can throw it out on the window. Winning percentage? You can toss that one away, too. OK. Maybe we’re overstating that a bit. However, it is fair to say that what probably are the two most popular trading statistics basically are useless — by themselves. Unfortunately, that exactly is how many people evaluate them. Many traders will jump into a trade with a reward-to-risk ratio of three-to-one, just because they presume this means they will win $3 for every $1 they lose. Likewise, other traders are drawn to 90% winning percentage strategies like moths to a flame. They must enjoy the frequent sound of the cash register, ringing after each win. No doubt, making money on nine out of every 10 trades does sound pretty good. In both cases, however, the traders following these approaches are missing a critical piece of the puzzle, and it’s a piece that can make a major difference in their bottom lines. “Questionable curves” (below) shows two hypothetical equity curves. 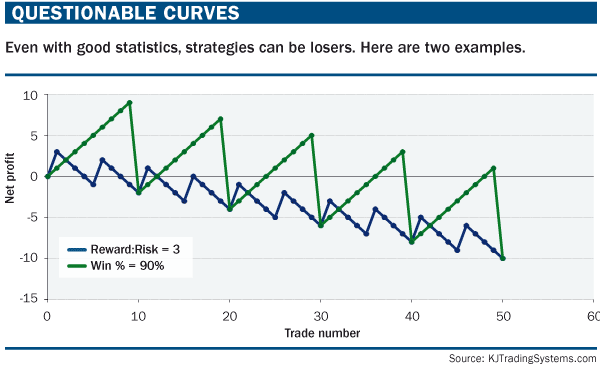 The blue curve represents a three-to-one reward-to-risk ratio system. The green curve represents a 90% winning percentage system. Both systems are appealing according to their selected standalone statistics, yet both systems are losers. Why? Simply put, those trading metrics by themselves are insufficient. Alone, they tell you only part of the story, and you easily can miss important facts about your trading system. All is not lost, though, as the key is combining these figures.